Clarify tasks and responsibilities with work packages. Assigned team members know exactly what to do, and when to do it. Create, assign and organize team tasks in work packages without having to create a timed project plan. InLoox PM 8 provides you with the view over all projects. To open the work package view, do one of the following. Click InLoox PM tab on the Outlook Ribbon and then Work Packages. 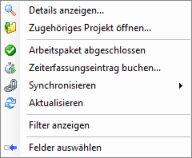 In Outlook 2007 the work package list is automatically displayed, if you are added as resource to the work package click. Click Work Packages in the tree structure on the left under Projects. Open an associated project Choose one work package from the list and click Open Project, in the InLoox PM group. Display work package details Choose one work package from the list and click Open Details, in the Actions group. Mark work package as complete Choose one work package from the list and click Mark Complete, in the Actions group. Synchronize with Outlook elements Choose one work package from the list and click Synchronize. Choose from the drop-down list With Outlook-Calendar or With Outlook-Task. Book a time tracking entry to a project Choose one work package from the list and click Add Time Tracking Entry, in the Actions group. My Displays personal work package. My teams (project manager's view) Displays work packages of all members of projects of which you are a manager. All (project manager's view) Displays work packages of all members of projects of which you are not a manager. Display the done work packages Click Include Complete in the Display group to see all work packages that marked as complete. Print a work package view Click Print, in the Current View group, to start the quick print feature of the archive view. For more information see Print the project list. Refresh Via the Refresh button, in the Current View group, all changes will be updated and the view reloaded. Filter the needed information Click Filter, in the Current View group. To learn more about the filter feature, see Search and find projects, in the Use filters section. The following features as Save, Reports and Stopwatch are described in Ribbon/Toolbar. State(completed or open). The planning item will be immediately marked with the check mark in the planning, if you will activate the this work package is completed control box. Unhide the Work package side panel to get an overview of your work packages on the right side of your current Outlook folder. Click the InLoox PM tab on the Outlook Ribbon and then Show Work Package List in the Extras group. A click on the empty space in the work package list invokes the Ribbon menu. A double-click on the entry from the list invokes the Work Package Details dialog box. The description of all these features from the Ribbon van be found in the upper section. The description the Work Package Details dialog box can be also found in this section. Search work packages Use the Search feature above the work package list. Use the filter feature to quickly reach the needed data from each column. For more information, see see Search and find projects.